What is the Sabbath? What is “The Lord’s Day”? There has been much confusion caused by grievous wolves on this subject of the Lord’s Day. Beware of the Judaizers that try to keep the law of Moses! The testimony of the Word of God is clear to those who don’t have an ax to grind — or a date at their favorite Restaurant. 1. It is not the Jewish Sabbath. Contrary to Seventh Day Adventist literature; Gentile Christians are not required to keep the Jewish Sabbath, which was Saturday. It was a part of the old covenant between God and Israel “throughout their generations” (Ex. 31:12-18). It was no more “perpetual” than other ceremonial laws (Ex. 29:9, Lev. 24:9). It was not given before Moses (Ex. 16:23-30; Deut. 5:2,3,15; Neh. 9:13,14; Ez. 20:10,12; Justin Martyr Dialog with Trypho). 2. It was not required of Gentile Christians, being part of the old covenant ceremonial laws (Acts.15, 21:25; Rom. 14:5; 2 Cor. 3:6-16; Gal. 4:10,21-31; Eph. 2:14,15; Col. 2:13-17; Heb. 4; 7:12; 8:6-13; 10:9,10 12:18-20); and Jesus, through his apostles, established a new memorial day, commemorating Jesus’ redemptive work, which was much more glorious than deliverance from Egypt or creation. This was all foreshadowed in the Old Testament and is an exciting study. The testimony of the New Testament is this: Jesus rose the first day of the week (Mt 28:1, Mr 16:2, Mr 16:9, Lu 24:1, John 20:1, John 20:19). He appeared to his disciples on the first day of the week (The resurrection day and the next Sunday- John 20:19,26); Pentecost was on the first day of the week (Lev. 23:15,16). The disciples came together for communion on the first day of the week (Acts 20:7). Paul admonishes them to take up their collection when they meet on the first day of the week (I Cor. 16:1-2). John was in the Spirit on the Lord’s Day (Rev. 1:10). All the early church writings verify it was on the first day of the week, Sunday. Early church writings are uninspired and used for historical evidence only. John died about 96 AD, so all the previous quotes are within 44 years of John’s death. Ignatius was the second bishop of Antioch, where the disciples were first called Christians, and knew the apostles. Above video & commentary from Mark Bullen “Teaching Them to Obey”. A MUST READ BOOK THAT WILL HELP YOU FUNDAMENTALLY UNDERSTAND THE BIBLE FROM THE OT TO THE NEW! CLICK HERE TO READ. 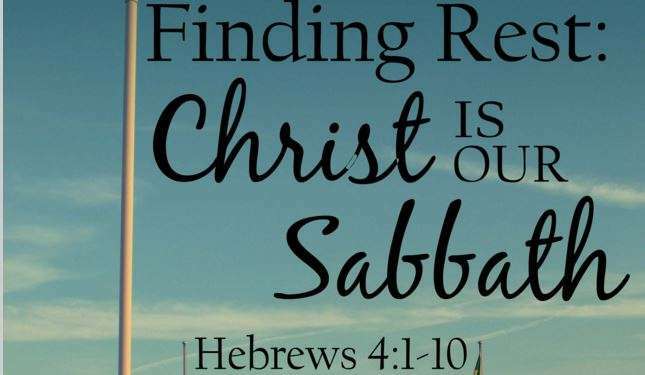 To understand how Jesus is our Sabbath rest is the Hebrew word sabat, which means “to rest or stop or cease from work.” The origin of the Sabbath goes back to the Creation. After creating the heavens and the earth in six literal 24 hour days, God “rested on the seventh day from all His work which He had made” (Genesis 2:2). This does not mean that God was tired and needed a rest. We know that our God is omnipotent, literally “all-powerful.” He has all the energy and power in the universe, He never get’s tired, and His most hard expenditure of energy does not diminish His power one bit at all. So, what does it mean that God rested on the seventh day? Simply that He stopped what He was doing, HE ceased from His labors. This is important in understanding the establishment of the Sabbath day and the role of Christ as our Sabbath rest. Jesus can be our Sabbath rest in part because He is “Lord of the Sabbath” (Matthew 12:8). As God incarnate, He decides the true meaning of the Sabbath because He created it, and He is our Sabbath rest in the flesh. When the Pharisees criticized Him for healing on the Sabbath, Jesus reminded them that even they, sinful as they were, would not hesitate to pull a sheep out of a pit on the Sabbath. Because He came to seek and save His sheep who would hear His voice (John 10:3,27) and enter into the Sabbath rest He provided by his death on the cross as a sin offering for those who obey. He told the Pharisees that people are more important than sheep and the salvation He provided was more important than the foreshadow; the Levitical & Ceremonial laws. By saying, “The Sabbath was made for man, not man for the Sabbath” (Mark 2:27), Jesus was restating the principle that the Sabbath rest was instituted to relieve man of his labors. We no longer rest for only one day, but forever cease our laboring because of HIS sacrifice on the cross. Jesus is our rest now, just as He is the door to heaven, where we will rest in Him forever as long as we pick up our cross daily and abide (obey) in Him. Hebrews 4 is the definitive passage regarding Jesus as our Sabbath rest. The writer to the Hebrews exhorts his readers to “enter in” to the Sabbath rest provided by Christ. After three chapters of telling them that Jesus is superior to the angels and that He is our Apostle and High Priest, he pleads with them to not harden their hearts against Him, as their fathers hardened their hearts against the Lord in the wilderness. Because of their unbelief, God denied that generation access to the holy land, saying, “They shall not enter into My rest” (Hebrews 3:11). In the same way, the writer to the Hebrews begs his readers not to make the same mistake by rejecting God’s Sabbath rest in Jesus Christ. There remains, then, a Sabbath-rest for the people of God; for anyone who enters God’s rest also rests from his own work, just as God did from his. Let us, therefore, make every effort to enter that rest, so that no one will fall by following their example of disobedience (Hebrews 4:1–11). There is no other Sabbath rest besides Jesus. Is God Omnipotent, Omniscient and Omnipresent? Tender Mercies or True Love?